Watch as fragrant, colorful tea steeps before your eyes, and stays warm by a flickering tea light. What is more elegant than watching fragrant, colorful petals of tea permeate into warm water? Most teapots are opaque, but this stunning translucent pot allows you to keep an eye on your favorite drink as it steeps. The matching glass chamber holds a twinkling tea light to keep the brew warm while you sip and entertain guests. Send the elegant gift to a friend or loved one so they can enjoy the sculptural beauty and soothing sips. Tea light not included. Made in China. Pair the teapot & warmer with our Steeping Flower Blossoms for a truly uncommon cup of tea. Teapot: 9.5" L x 5.5" W x 5.2" H, holds 27 fl oz. Suitable for hot water up to 248°F / 120°C. Do not place teapot on stove or in microwave. Hand washing both the warmer and tea pot is recommended. 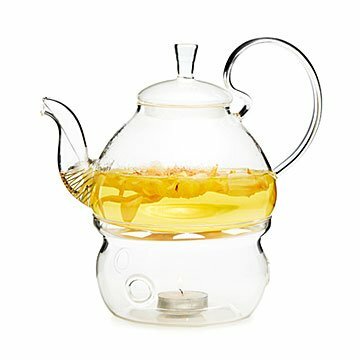 I fell in love with the idea of the blooming tea, so when I looked to see if the beautiful clear glass tea pot that it was pictured in was also for sale (because you want to actually watch the flower unfold before your very eyes!) I couldn't not get that too. I did read all the reviews before I bought this, and have concerns about the warmer not being very effective but watching the flower was more the purpose for this buy. as soon as we put the tea pot on top of the warmer the tea light went out. we tried relighting it and letting it burn for a little bit. we tried pushing it over to one of the vent holes on the side. all to no avail. there just isn't enough air getting to the candle once you put the pot on top of the warmer. The recipient, a self-proclaimed tea snob, said, "It's beautiful~! I have flowering tea... I used it right away."